Digital Technology standards are of the highest quality, and are acknowledged as being among the finest in the TV repair business all-around Rochdale and North Manchester. Having over 30 years of experience you can guarantee that your television is in the most trusted hands. If you are having problems with your TV simply call 07946-322073 and Digital Technology will call you back to arrange an appointment suitable for you. 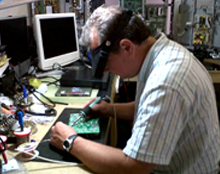 After Digital Technology has inspected your television, we will then give you a no obligation estimate for the repair. If you would desire no further work to be carried out, Digital Technology are satisfied to bring back the television to you. We will always be truthful & let you know whether a repair is worthwhile carrying out or not. We also carry our repairs to TV appliances such as Freeview receivers, DVD players/recorders, satellite recievers etc and the above call out services apply to these items as well. Digital Technology offer a full installation service, for full details either contact us via our contact page or give us a call on 01706 354390 - 07946 322073.